Washington, D.C. — Nonresidential construction spending rose 0.5 percent in September, totaling $698.1 billion on a seasonally adjusted basis, according to an Associated Builders and Contractors (ABC) analysis of data from the U.S. Census Bureau. However, nonresidential construction spending is down 2.9 percent on a year-over-year (YOY) basis, with construction spending related to manufacturing down 20.3 percent since September 2016. August and July nonresidential spending totals were revised upwards by a collective $11 billion, however. “There is a lot of positive news about the U.S. economy right now,” said ABC Chief Economist Anirban Basu. “The nation has added nearly 1.8 million net new jobs over the past year, the official unemployment rate stands at a 16-year low and asset prices have skyrocketed. Those factors have given American household wealth a boost. 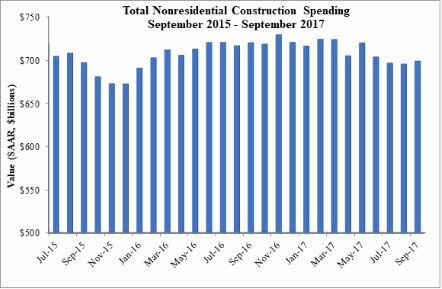 Despite all of that, nonresidential construction spending is down on a year-over-year basis by nearly 3 percent. “Much of this is due to declining public spending in water supply and other public sector categories, but not all,” said Basu. “Key private segments like manufacturing and power have also experienced diminished construction activity. A likely partial explanation is the low commodity prices that characterized much of 2015 and 2016. “At the same time, construction firms are boosting employment levels, with many firms reporting that the retirement of experienced workers is resulting in rapid hiring of other workers who are hopefully trainable, but who are not yet as productive on a one-for-one basis,” said Basu. “For many firms, this dynamic is likely squeezing profit margins. Many firms are also offering significant pay increases to their most talented workers to enhance retention and delay retirement.